The PLAN’s Type 094 Jin-class submarines will be capable of delivering nuclear JL-2s. In recent days, there have been several reports that the Chinese navy (PLAN) has, for the first time in the country’s history, reached a credible sea-based nuclear deterrent. Defense News reports that the China’s JL-2 submarine-launched ballistic missile (SLBM) is expected to reach initial operational capability (IOC) by the end of 2014. The source of the report is a forthcoming report by a U.S. congressional commission on China. The reports are in line with analyst expectations for China’s SSBN program. According to the report, the PLAN’s sea-based deterrent will have a range of 4,000 nautical miles, lending it a comfortable position against targets on the North American western coastline. The deterrent will be delivered via the much-discussed Type 094 Jin-class nuclear ballistic missile submarine (SSBN), three of which are in active operation by the PLAN. China is also pursuing more advanced SSBNs: the Type 095 is expected to be a guided-missile attack submarine, and the Type 096 is expected to be a next-generation successor to the Type 094, reinforcing its “range, mobility, stealth, and lethality.” The aging Type 092 Xia-class submarine was largely a failure and is expected to be retired soon. The Type 094 Jin-class submarine is additionally what is known as a “boomer,” capable of launching both 12 to 16 JL-2 missiles with a "range of about 8,700 miles, covering much of the continental U.S. with single or multiple, independently targetable re-entry vehicle warhead,” according to The Washington Times. The Congressional report also states that U.S. facilities on Guam will soon be within conventional missile range. Nuclear-equipped SLBMs are widely understood to be the pinnacle of a robust “nuclear triad” deterrent system. The United States and Russia have been the only “nuclear triad” powers to date, maintaining a robust arsenal deliverable by land, sea, and air. India, with its indigenously-developed nuclear submarine, the INS Arihant, is expected to field a triad deterrent soon as well. 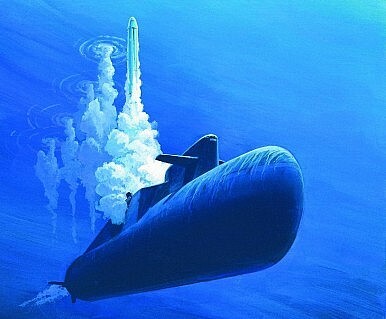 However, the deadliness of SLBMs is such that both France and the United Kingdom – two of the original nuclear powers – have a deterrence strategy based squarely around SSBNs (France maintains a small air-based deterrent). A deeper look at Yulin-East, China's burgeoning submarine bastion in the South China Sea.